Prime Minister Hailemariam Desalegn of Ethiopia addresses the General Assembly. In his maiden speech to the United Nations General Assembly, the Prime Minister of Ethiopia, Hailemarim Desalegn, today said that his country will keep contributing to regional integration efforts, but its success in this regard will depend on conditions being met in two areas: peace and stability and the challenge of extremism, and issues related to its capacity to ensure sustainable development. “We foresee huge possibilities for bringing the countries of the greater Horn of Africa together,” Prime Minister Desalegn told the 67th Assembly’s General Debate, taking place at UN Headquarters in New York, not long after assuming office in the wake of the death of his predecessor, long-serving Ethiopian Prime Minister Meles Zenawi, in August. Prime Minister Desalegn noted that the Ethiopia has already made progress in regional integration, playing a “catalytic role” in laying the infrastructural basis for consolidating economic ties with the countries of the East Africa region. In relation to peace and stability and the challenge of extremism in the region, he pointed to his country’s neighbours Somalia, Sudan and South Sudan. Somalia has been undergoing a peace and national reconciliation process, with a series of landmark steps over recent months helping bring an end to the country’s eight-year political transition period. These steps included the adoption of a provisional constitution, the establishment of a new parliament and the selection of a new president. However, despite the recent advances in its peace and national reconciliation process, Somalia – with the support of the UN-backed African Union Mission in Somalia (AMISOM) – is still dealing with the impact of the Al-Shabaab militant group, which has been pushed out of Mogadishu but still controls some areas, primarily in south-central regions of the country. On relations between Sudan and South, the Prime Minister said his country was pleased about the major progress in the peace process between the two, and is confident the two will maintain the momentum towards “durable” peace. South Sudan became independent from Sudan in July last year, six years after the signing of the peace agreement that ended decades of warfare between the north and the south. However, the peace between the two countries came under threat in recent months over armed clashes along their common border and outstanding post-independence issues that have yet to be resolved. Earlier this week, at talks held in the Ethiopian capital, Addis Ababa, under the auspices of the African Union High-Level Implementation Panel, the two countries’ Governments signed agreements on security, the common border and economic relations. In relation to Ethiopia’s capacity to ensure sustainable development, Prime Minister Desalegn stated that there is a huge deficit in international cooperation for the development of low income countries and those that are the least developed. “At the end of the day, without ignoring other impediments to development, the major bottleneck for countries such as Ethiopia for ensuring sustainable development and successfully achieving the MDGs (Millennium Development Goals) is related to shortfalls in development finance,” he said, referring to the eight MDGs, agreed on by world leaders at a UN summit in 2000, which set specific targets on poverty alleviation, education and environmental stability, in addition to other areas. He added that the current global economic situation should never be allowed to detract attention from the critical need for development finance in low income countries, noting that Ethiopia’s challenge in this regard is compounded and made even worse by climate change and it seeks “effective cooperation” in this endeavour. Prime Minister Desalegn is one of scores of world leaders and other high-level officials presenting their views and comments on issues of individual national and international relevance at the Assembly’s General Debate, which ends on 1 October. 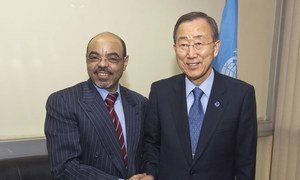 Secretary-General Ban Ki-moon today said he was deeply saddened by the death of Ethiopian Prime Minister Meles Zenawi and offered his heartfelt condolences to Mr. Zenawi’s family and to the Government and people of Ethiopia.